All of us have experienced cognitive dissonance. That is the stress that is created when we try to hold two or more conflicting beliefs or values in our head, or when we do something or learn something that conflicts with these beliefs or values. Cognitive dissonance theory says that we all try to keep our mind (our cognitive function) peaceful and in harmony and that when a conflict arises (dissonance) we will act to reduce the conflict, most times without our even realizing that we are doing so. So where does the Holy Spirit fit into this? 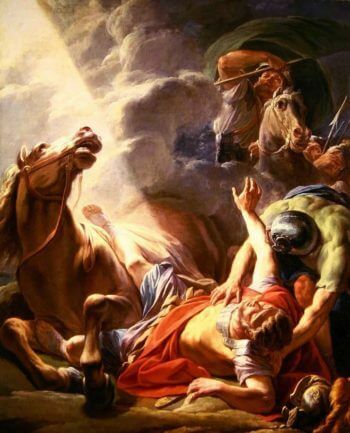 To get his attention, God struck Saul blind on his way to Damascus. God does not usually use such a direct method with us. It is very rare that God strikes us blind the way he did to Saul in order to give us a clear vision of the road we are to follow. For most of us, God’s call it is a quiet, nagging voice that prods us this direction or that. Sometimes, we heed that call and go willingly in the direction God would have us go, but most times not. All too often, the word of the Spirit creates a cognitive dissonance—a conflict between our world view and God’s view. We all are guilty of shaping the word of God’s to make it more comfortable for us to hear. For instance, when God says to help the poor, we tell Him we have that covered when we pay our taxes. God says love our brothers, we do but point out that we really deserve credit for putting up with them as well as we do. God says love our enemies, we say that we do love them, but we are showing tough love by not validating their sinful lifestyle and by showing displeasure in their inappropriate life choices. Throughout Jesus’ earthly ministry, he was calling on the religious leaders to open their minds and actually hear what the Word of God says. Ever since their days in the wilderness, the priests and scholars in their zeal to obey the law had come up with hundreds of “what if’s” in which they had argued and debated the different ways that God’s commands could be interpreted. These were codified into an oral tradition. At the time of Jesus, the Pharisees were the teachers of and the enforcers of the oral tradition. In their mind, these traditions became equal to the actual Word of God. They became the moral code that they bound themselves to. So when we study God’s word and hear it addressed to us, we must be very careful that we hear the actual intent and not our minds watering down of the message. The very fact that there are so many denominations and divisions within the Church is a testament to how difficult it is for us to do this. If you keep these words in mind whenever you hear God speaking to you, you will know that you are on the right path. The Priests and Scholars took this verse which says that a person who takes an oath should stand by it to also mean also that nothing should be done that causes a person to break an oath. What developed over time was that people could avoid financial obligations by claiming that the money had been pledged to God because forcing him to pay would force him to break his oath. It has been pointed out that the Priests had a vested interest in making this ruling because all of the money pledged in this way, was pledged to them for their use. In time, this became a deplorable practice. People who declared a sum of money corban were no longer obligated to use it to pay debts or obligations. This included using it to care for their father and mother. Eventually it developed that once pledged, they didn’t have to give it to the temple either. Only a small gift to the temple needed be made with continuing small payments, with the understanding that the rest might perhaps be paid at some unstated future date.